Down in the jungle where nobody goes, there is something very exciting going on! If you are very quiet, you will see lots of very busy animals. But what they are getting ready for? Find out by peering through the die-cut holes on each page. 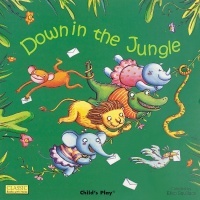 Then join in the party spirit by singing along with this well-loved song, and imitating the animals’ actions as you do! All children love this traditional rhyme and singing along to this will help to develop number skills. Bouncy illustrations, innovative die cutting and popular rhymes make Books with Holes a must for every child. Available in three formats, suitable for babies, toddlers, pre-schoolers and the nursery or classroom.